There was a movie a while back called Gung Ho that comically depicts the high standards of the Japanese workforce. In reality, this intense work ethos may be what's responsible for the high suicide rate in Japan. A recent US survey reveals that the life expectancy for the average CEO after retirement is about thirty months. So even if your job doesn't kill you, not showing up for work doesn't fare so well either. Finding oneself without purpose after a lifetime of work and achievement must be akin to having the rug pulled out from under you. I used to train with a woman with four young kids. Even after she earned her black belt she continued to train five times a week, teach on the same days and hold down another part time job. It was a bit much and her hectic lifestyle was palpable. Commitment is essential in the martial arts, but not when it morphs into fanaticism. Do you consider yourself a devotee of the martial arts? What do you enjoy doing when you're not in the dojo? Do you have any hobbies besides your training? (My apologies to the devout budoka who may be offended by the notion that the martial arts are a "hobby".) When the medieval kenshi Miyamoto Musashi said "learn the ways of other men" he wasn't referring to different styles of combat. Judo founder Jigoro Kano and karate's Gichin Funakoshi were skilled in the art of calligraphy and poetry. Musashi made beautiful paintings, wood sculptures and hand guards for swords. These men set aside time for creative outlets as a way to counterbalance their considerable efforts invested in the martial arts. Training to the exclusion of all else leads to stagnation and craziness (kichigai). "All work and no play makes Jack a dull boy" said Jack Nicholson's character in The Shining. And we all know how Jack ends up. I am a father with a child studying the same style I do. Working with her is one outside activity I do, especially during my rehab period post-op for ACL reconstruction. I thoroughly enjoy video production and create DVD's of belt promotion tests at my martial arts school and other small video productions. I'm also a musician performing part-time in a band writing original music. Our music is recorded at my home studio. In-between all of this I occasionally work for a living! Great post...point one must teach especially if you detect a student who may be taking the extreme. I temper my devotion to other things as I realize that my training benefits everything I do in life. Diversify and then create balance. With out balance you will fall...it is just a matter of time. One of my pet peeves from my aikido days were what I called “Dojo Nerds.” FJ Lovret had a great quote: Budo should enhance your life, not replace it. The Dojo Nerds were the opposite of that. You could identify them immediately. 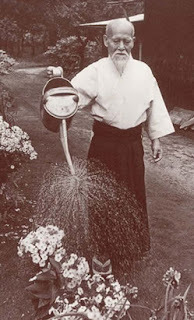 Our Japanese Sensei had a very strong character, like a force of nature. The Dojo Nerds wanted to imitate him to the point where they could no longer speak English, their native language well, because they were always imitating his broken English. They spoke broken English even outside the dojo! Every other word out of a Dojo Nerd’s mouth was “harmony” yet their personal lives tended to be in shambles (maybe because their lives revolved around the dojo). Divorces, chronic under or unemployment (even during local job booms), and under achieving in every aspect of life outside of the dojo. I guess they tick me off so much because I nearly became one. I was lucky that I am married (going on 25 years now) to a very level headed woman. My own training had been on hold for a long time, as I concentrated on my career to a certain extent, but mostly on my family. My oldest will be graduating college this spring, and my youngest is a junior in high school. With the youngest now driving herself around to her activities, I have more time on my hands, and I started training (in taijiquan, not aikido, which is another story) again during the summer. Besided taijiquan, I lift weights,and walk on a treadmill. I read a lot (life long habit there). I spend some time on the Internet (but not too much), and study the Japanese language. When my youngest goes off to college, I may take up golf. My goal is to be healthy and well balanced (in every sense of the word) as I slide into old age. i enjoy reading, though I don't get much time to relax and read. Mostly biograpgy and history, but some sci-fi and fantasy too. Oh, and I love Louis Lamour. My day job is as an exercise physiologist running a cardiac rehab. And we are active at church. I was borderline obsessed about my training when I was in the misdt of it. I thought about it constantly and was always going over moves in my head. The only way I broke free from that was having my injury force me out of karate permanently. It has opened me up to new things now, thank goodness. Now I can say I hardly miss it. Someone once asked me (not seriously, unfortunately) if I would give up all my hobbies for a million dollars. My response was "Of course. I'd have a new set of hobbies by the end of tomorrow." There are a million things I would love to do. At the moment, besides karate, I knit, spin, play piano, and am working on learning to play the guitar. I also read extensively and write, but I don't count those as hobbies, since I would rather read than sleep, and with any luck should be able to attach "published author" to my name within the next year. "Dojo nerds"~ what a great term! I know one of those..and he is quite annoying. He's one of those who seems to believe that if he takes every single class offered he will know more than everyone. Then he gets bossy and tries to correct everyone else-even black belts. UGH! He needs to find balance-big time. When I'm not at karate, I do find myself thinking of karate a lot, but its usually while I'm crocheting or gardening or doing laundry and dishes and raising 2 teenagers. I practice kata in the kitchen while making dinner. I also work 40 hrs a week. I have a multitude of other hobbies and interests outside of martial arts-Drawing, dancing, astronomy, yoga, animal and environmental issues, learning new languages, cooking, dog training, reading, photography, etc. Its challenging to balance the all with training, work and wedding planning, however. Well, if there's one thing injuries do, it's force you to find other outlets. Does online shopping count? I have two part time jobs that I do from home (recruiter and teacher). I also raise two kids, read a ton, obsess over Project Runway, crochet (before I had a two-year old to make me forget which stitch I was on), play fantasy football, do hours of physical therapy every single day etc. etc. etc. Balance is key. I think balance and not being a "dojo nerd" helps prevent injuries from over-training. The week I tore my ACL, I had done SO much training at class and at home. I learned my lesson. I can think of worse things to do then train too much, wary of possible overtraining or burning out. If people have no sense of self, the change has to occur from within. Sure, balance is great, but some people have no sense of identify. They don't like themselves and want to become something better. So, they emulate those for whom they have respect. Not a great way to go, perhaps, but in the grand scheme, if one is inclined to obsession, I think that a physical pursuit is healthier than 8 hours or more per day on Worlds of Warcraft. I completly agree with you. It is important to have something else to enjoy so as when you come back to training, you dont feel bored with it. Playing with the kids, watching some footbal on TV, going bowling with the guys. It all helps to keep the mind fresh.Nice post! There really is so much more to life. One thing I've learned is to bring what you learn in the dojo into your everyday life. Yes, I think about karate all the time, and sometimes it can be obsessive, but that's my nature. It never, ever gets out of hand to the point where I am not present with my family or with my massage clients. If I do not read every day I'm a grump, and it's not only martial arts literature. I also play the piano, do yoga on occasion, go for walks, play with my three year old boy, have talks with my husband, am in the process of knitting four different projects, the list goes on. Of course I would love to be in the dojo more than twice a week, but I have a great driveway to practice kata while the boy rides his battery operated tractor around the house. Karate is not my life, it is part of my life. How boring would life be if karate were the only thing in your life? I remember a woman training in another dojo that got divorced. [Mat] - I could almost see that. Mostly because of a philosophy I read some time ago that made sense for me. He (I wish I could remember his name) commented that when two things in your life conflict with each other unnecessarily, the one to get rid of is the one causing the conflict. If your dog bites your husband, get rid of the dog. If the husband beats the dog, get rid of the husband. Or in this case, if your dojo objects to you spending time with your husband, drop the dojo. But if your husband objects to you spending time at the dojo, get rid of the husband. Which makes some sense, as the person who objects to one commitment is likely to object to any other commitment you make. Well, I don't know more than what I said. There could be millions of reasons, added up, that culminated in a breakup. Yet, the title said it all. There has to be balance in life or else there is sorrow. I think that this posting is a great wake up call to all those who find themselves going overboard in their work, hobbies, or training. Thanks for writing it.